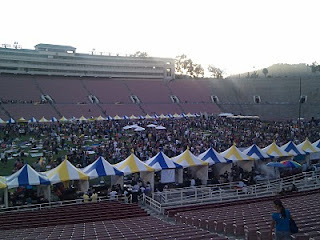 Summer fun has been keeping me super busy but here I am finally with a quick post on today's LA Street Food Fest at the Pasadena Rose Bowl. 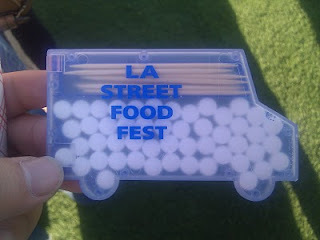 Cool swag from the food fest. My boyfriend and I arrived at 5:15pm and the long line to get in was already starting to snake around the huge parking lot. Doors opened at 5:30pm and we were through the gates by 5:45pm. Not bad. However, the organization of the event could really be improved. After getting our tickets scanned for entrance, we had to go into another long, unorganized line for wristbands for the open beer/cocktail bar and tequila tasting. The ice cream vendors and cocktail bar were right by the entrance while the beer, tequila and rest of the 50+ food vendors were on the stadium field that had to be accessed by walking through a tunnel and down a long flight of stadium stairs. The separation of the two area ruined the event flow. The tequila tasting and food vendors like the super popular Grilled Cheese Truck were located on the top floor of the stadium making the access also inconvenient. Food vendors were lined around the perimeter of the stadium field and the lines were loooooong with average waits at 15 minutes per vendor. Some waits were much longer for popular vendors like Dogzilla or vendors who weren't as well organized with food prep, but to be fair, the event organizers had most of the food vendors to do their preparation and cooking outside of the stadium. They had to run up the stadium stairs to get out to their food and run back down the stairs to serve their food to folks on the field. Not very good planning and foresight on the event planning side; I felt sorry for the food vendors. The event encouraged people to bring picnic blankets and many people laid them in the center of the field but because waits for food was so long, many people (including me and my boyfriend) were busy waiting in separate lines so many blankets were unused and taking up scarce field space. We were constantly jumping around blankets, bumping into people and avoiding the occasional stroller (yes, strollers were not allowed but some still found their way in). There must have been more than 5,000 people there. Long lines everywhere. Dim Sum Truck - The shrimp har gow and pork siu mai were good but you can never beat eating them fresh off a dim sum cart. The vegan corn & tofu sticky rice wrapped in lotus leaf was surprisingly good without the traditional pork filling. I know - vegan and Cantonese food sounds like heresy! Fresh Fries - Nutella & peanut butter sweet potato fries were oh so yummy. Gastrobus - Of all the food we tried, the most delicious and memorable bites were from Gastrobus. The Ecuadorean Shrimp Ceviche was refreshing and the tomato, citrus juice made the shrimp dance in my mouth. They also had a Dulce de Tres Leche dessert topped with fresh pineapple and toasted coconut. That was so good I contemplated stealing the whole tray or offering them money to buy the whole thing. I can't wait to eat there again. Jaliscos Tacos - The beef and chicken tacos were pretty good but didn't beat my bar for tacos. Kabob N' Roll - They served a surprisingly moist and juicy chicken kabob. Komodo - This was our first stop and their beef satay did not disappoint. Mandoline Grill - I went back twice to catch their pork banh mi with no luck. The tofu banh mi was okay. Mariscos Jalisco - Delicious fried shrimp taco. The corn tortilla was lightly fried and topped with a slice of avocado and salsa. Mmmm. McQ's Smoke House - The bbq pork rib was a bit dry. Scoops - They are opening a location in Palms/Culver City soon. Yay!! Brown bread ice cream!!! Starry Kitchen - I was really looking forward to trying SK but they only served a fried tofu ball. It was okay; nothing surprising or impressive though. We're not big tequila drinkers, the Singha beer was served out of bottles instead of tap so the lines were super long and we missed out on the cocktail bar because it was separated from the food vendors (ugh). We gave up on waiting in the insanely long lines for Grilled Cheese, Dogzilla and Antojitos even though we really wanted to try them because we were tired and only had 30 minutes left to check out Unique LA. If we didn't split up half the time to get food, we would have tried less food and left the event hungry. Overall, I guess this was an improvement over their February event. That one didn't limit ticket sales and it was located in Downtown LA. I headed somewhere else as soon as I read on Buzz that the lines were out of control. I can't say that I really got my $45 worth this time. The lines were too long, bites too small and the event wasn't mapped out well for convenience and flow so it made it very hard to relax and enjoy the picnic blanket we brought, which we didn't even bother to lay out. Thankfully I was there with Dan; he made the event much more fun and he was a trooper for putting up with the long lines with me. I agree - Gastrobus was the best truck there. They were also the best at the first SFF. You should have tried the Dogzilla line - it was long, but actually very fast. Our wait was maybe five minutes. I had a good time there. I certainly don't feel as though I were fooled twice, and I wish you'd had the same experience. I had a great time there! Yes, not the best flow for the event being part in the bowl and part out, and dodging all those blankets was a hassle. But if you think a 15 minute line is loooong, you probably shouldn't be going to LA events at all. I agree with you too. I went to the last food fest and actually enjoyed that quite a bit more! I did have a good time but I still think the organizers have a few kinks to work out. I'm sad I didn't get to try Gastrobus' dessert! hey kat it's me ben, I'm checking out your blog, ok bye! I thought it was a disaster! i was there for almost 3 hours... had 2 bites of a sandwich, 2 tastes of ice cream, one tofu ball, and piece of tortilla... one beer... i was starving! had to go out to dinner. what a waste of $45! i'll never go again... and now, for some reason, i can't post comments on their facebook page??? hmmmm, someone is messing with us!! darn, didnt know about Mandoline Grill and banh mi, that would have been nice. Agreed on the sweet potato fries with nutella and PB. What a great combo.